Nipkow, T., Grumberg, O., Hauptmann, B. Recent decades have seen major advances in methods and tools for checking the safety and security of software systems. Automatic tools can now detect security flaws not only in programs of the order of a million lines of code, but also in high-level protocol descriptions. There has also been something of a breakthrough in the area of operating system verification. 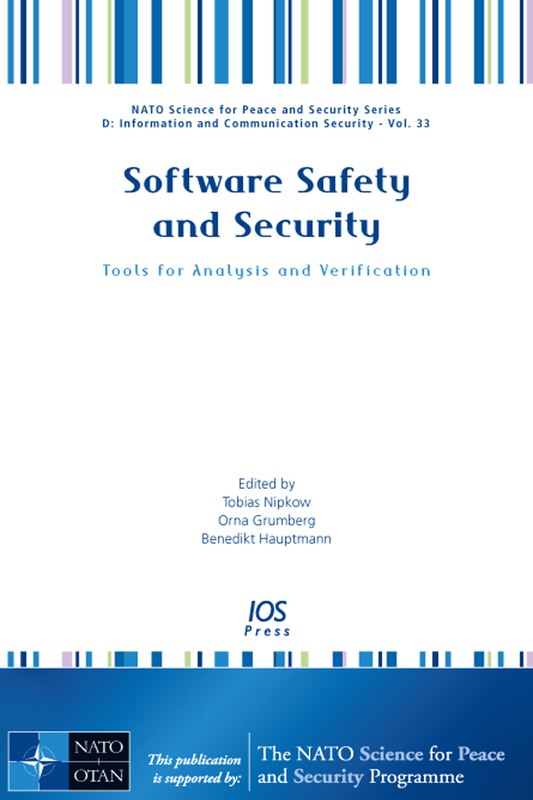 This book presents the lectures from the NATO Advanced Study Institute on Tools for Analysis and Verification of Software Safety and Security; a summer school held at Bayrischzell, Germany, in 2011. This Advanced Study Institute was divided into three integrated modules: Foundations of Safety and Security, Applications of Safety Analysis and Security Analysis. Subjects covered include mechanized game-based proofs of security protocols, formal security proofs, model checking, using and building an automatic program verifier and a hands-on introduction to interactive proofs. Bringing together many leading international experts in the field, this NATO Advanced Study Institute once more proved invaluable in facilitating the connections which will influence the quality of future research and the potential to transfer research into practice. This book will be of interest to all those whose work depends on the safety and security of software systems.